As you cross the gated, covered bridge you'll see this is a unique mountain property. 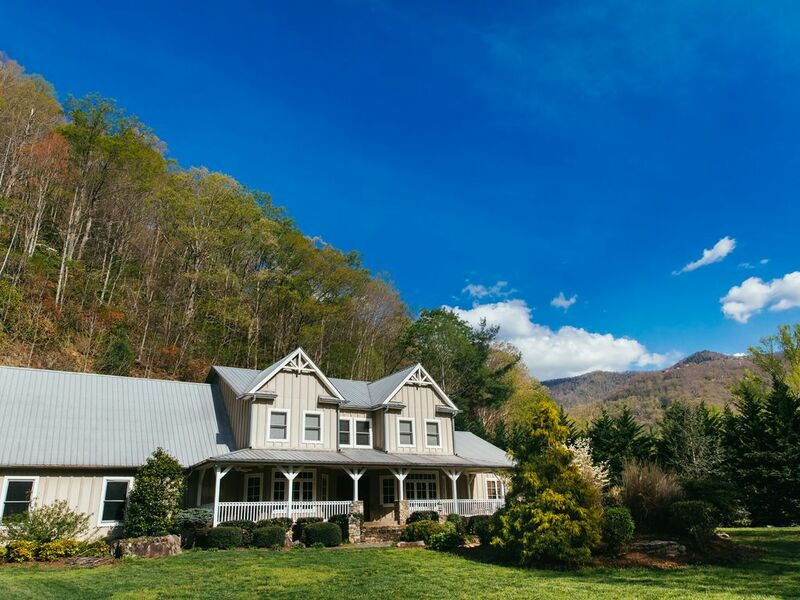 The 4700+ square foot home sits right on rushing Jonathan Creek, the main creek that runs through Maggie Valley. Situated down in the valley, you are surrounded by mountain views. The property is flat and easily accessible year round. The home offers 4 bedrooms with king beds and a upstairs bonus room with 3 twin beds and two full beds. The downstairs master bath offers an oversized jacuzzi tub, a glass enclosed shower with body sprays and two vanity areas. Upstairs offers 3 bedrooms and two full bath areas. One with a jetted tub! The bunk room is great for groups. There is a well appointed kitchen and seating in the dining area, breakfast nook and bar for 16. A warm great room featuring a 22' rock gas fireplace. A full size pool table for some after dinner fun! The outdoor area is perfect for relaxing. The outdoor kitchen area provides a large gas grill, sink and refrigerator. The back porch has a lovely view of the 12' waterfall. There's a farm table for family dinners even! If the guys need some time away, the garage has been converted to a "man cave". It provides a large, leather sectional couch, ping pong table and black jack table. And there's also corn hole! Just so you know, we also have wedding/event options for The Willow House! We can plan your ceremony/reception or help with a coorporate event. This property has access to a 3000 square foot Social Barn. An additional fee is required for use. My husband and I built this home in 2004. We raised our 3 children here. My husband is a Maggie Valley native. We met as students of Western Carolina University in the 80's! I grew up in Monroe, NC but made Maggie Valley my home in 1988. We started an excavation company after college. I drove a dump truck and he operated the machines. In 1995, we had the opportunity to start a wedding chapel. This was the beginning of Miss Caroline's Wedding Chapel in Maggie Valley. It's actually located at the entrance of the drive that takes you to The Willow House. We added honeymoon cabins as the business grew. Now that our baby is 21, we decided to downsize and thought it would be great to share our property with families. We have constructed a barn on the property for events. This is available for an additional fee if you're planning a wedding or family get together. The property is so convenient being situated in the valley yet such an oasis. You can relax by the waterfalls, fly fish in the creek, play corn hole in the yard, etc. We want you to come and enjoy our home as we did for 13 years. It's a very special place! Jonathan Creek is right in the front yard! Great for fly fishing, wading, etc. Totally unique home sitting on the creek yet in the heart of Maggie Valley! We can also host your wedding and reception. We offer a 3000 square foot Social Barn and lots of beautiful outdoor venues. Additional fee required for these services. I would not rent from these people again. The landscape of the property is quite charming and peaceful and the house was nice - needs some repairs in a few areas (water running into the garage when raining, outdoor kitchen was completely nonfunctional) but still nice. What truly bothered me though was the insurance policy that you are required to buy before you can book with them. Sure enough they found something to claim as "damage" from the insurance company. One of our adult children backed a vehicle up onto the grass instead of the gravel side road - leaving a rut in the yard, as it had been raining. Not smart on her part - but worth $2,200.00??? I think not! Really left a sour taste in my mouth...seems almost fraudulent. We won't be returning. The Willow House is primarily a wedding venue. We allow guests to enjoy the home in the “off wedding season” as it’s perfect for fimilies and large groups. Our rental rules state to please stay off the grass. Our grassy areas are not just a yard. They are ceremony sites. The fact that it had rained 4” the night before didn’t help matters. However accidents happen. We require guests purchase insurance through VRBO in leu of holding a credit card deposit. The insurance policy is so beneficial to the guests because the homeowner must provide documentation, repair estimates and photos if there is damage. If a property owner is holding your credit card you are basically at their mercy. Repairing grass to match is tough. Pallets of sod aren’t cheap and the labor is extensive. That’s why purchasing $99 insurance is a much cheaper option than paying $2200 out of pocket. Future guests please use our large, flat concrete drive. Quiet & secluded but right in the middle of town! Willow House has plenty of room to gather plus everyone had their own personal space. If you want family time, this place is perfect...back porch/yard area is perfect and you are only steps from the creek. 10 mins to the Blue ridge Pkwy, 15 mins to mtn dirt roads or good hiking, 30 mins to Cherokee, casino or Smoky Mtn NP, 45 mins to Asheville/Biltmore, less than an HR& half to Gatlinburg...all this if you want or just stay around Maggie Valley which has plenty to offer as well! Our VRBO host whom I will not name for privacy reasons was fantastic, she was inspecting the house as we arrived and she covered everything with us personal as well as recommending a few restaurants. She wasn't gone a few mins when she returned to fix the cable on the TV. I phoned her 3 times in 5 days & she promptly answered each time. I HIGHLY recommend the Willow House for the location, the amenities, the house & especially the host. Great choice for family time together plenty of room well furnished and a peaceful setting. We will be going hopefully to this rental for many years to come. The house was very comfortable and spacious. We also enjoyed the creek. We, the grandparents, treated our 3 children and spouses and grandchildren to a summer getaway. It was fabulous. The house and Jonathan Creek have activities for all ages and family games and activities. Beautiful house! Loved everything about it! The home is beautiful and we'll maintained. The waterfall features are beautiful and very relaxing. We enjoyed fishing in the creek on the property. I highly recommend this home. You will not be disappointed.